Historian Chloe Ellefson has a plum new assignment – spend a week on Rock Island in Lake Michigan to develop a furnishing plan for the restored Pottawatomie Lighthouse. Chloe is craving some alone time away from an annoying, meddling supervisor and from potential boyfriend Roelke McKenna. She finds the solitude she wants and much more. Upon arrival at the isolated site, Chloe finds herself in the middle of a centuries old fishing territorial dispute, along with something older and more sinister. Things don’t get any better when she starts finding bodies washed up on shore wrapped in fishing nets. 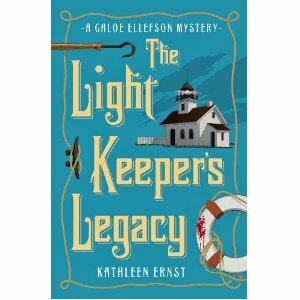 While she works with the local authorities to solve the murders, Chloe also finds herself drawn to a woman who lived in the lighthouse more than 100 years ago and who seems to be trying to communicate something to Chloe. We learn that Chloe has flashes of unusual perception that appear to fascinate and freak her out at the same time. Curious, Chloe researches the woman, Emily Betts, and along the way discovers a tragedy that has marked residents of the Rock and the surrounding area for more than a century. This was the first Chloe Ellefson mystery I’ve read, and I enjoyed it enough to go look up the earlier offerings. I found Chloe a likable heroine, despite her repeated use of the phrase “Geez, Louise,” which seemed a bit overdone. She’s smart, perceptive, independent, and kind but also stubborn and strong. The blend of historical and modern stories holds together nicely and develops into a solid story spanning decades. The story is set in 1982 and contains a nice nod to Sue Grafton, as it is her A is for Alibi that is given to Chloe at the beginning to keep her company on the island. This is a light, very enjoyable read featuring a smart and sassy young woman who will appeal to a wide audience.